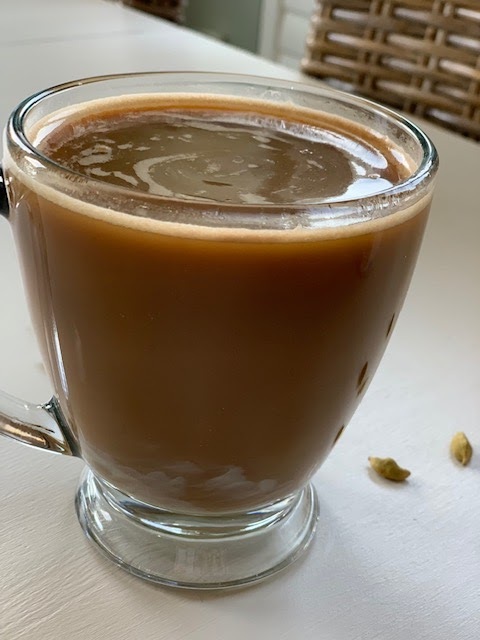 As we inch toward Valentine's Day, I have been thinking about ideas to start your sweetheart's day and this sweetened coffee drink with hints of cardamom and anise and cinnamon. Doesn't this sound like a wonderful way to get one's day going? I love using cardamom in hot drinks. There's a smoky element that goes well with coffee, with a bit of freshness that reminds me of lemon or mint. Cardamom is the world's third most expensive spice, following vanilla and saffron (by weight.) Don't worry, we only use a small amount! Serve on a tray with some buttered toast with a single rose and a pretty napkin (not paper!) and you will win kudos for a long, long while with this drink! A sweetened coffee with hints of cardamom, cinnamon and anise. Divide the sweetened condensed milk between two coffee glasses. Slowly add the coffee as to not disturb the milk. Divide the ground spices between the two glasses. Drinking the coffee first, and then the milk or stir the milk into the coffee before drinking. This is lovely served in a clear glass mug! I always stir the milk and coffee together as I am not fond of the bitterness of coffee without cream. You must go and visit my other blogging friends and see these delicious drinks they have made for you. You will want to stop what you are doing and make one, but I suggest that you go to work first and make it when you get home! For those people who love their coffee and can't live without it every morning, afternoon and evening this sounds wonderful. We actually don't drink coffee. I'm not a coffee drinker, either. My family loves it though. YUM! 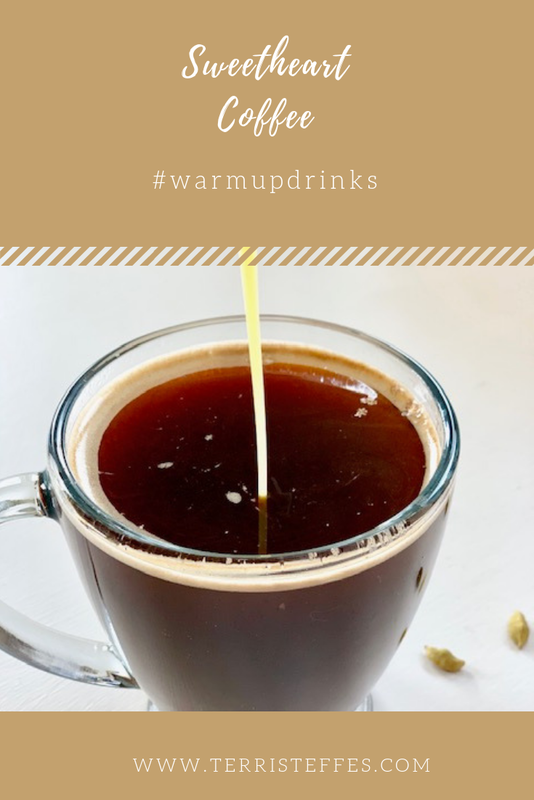 im a huge coffee drinker so this is something i think my family would really enjoy, especially my husband who likes his coffee a little sweeter! cant wait to try it! Sounds delicious! I love coffee and I love cardamom. I don't know why I've never thought to put the two together! Ooooh. Cardamom in my coffee? That sounds absolutely wonderful. Thanks for the info - I had no idea it is comparably expensive. This sounds tasty! I wish I liked coffee. I actually might like this, so I'd give it a try. I'm curious! My husband loves Coffee and now that he is off on the weekends I might make this for him as a nice treat since he has to work a long day on Valentines. As for the spice I hear a lot about it on cooking shows but haven't used it nor have I tasted it. So if its expensive I might have to save up to purchase it. Cardamom is such an under-utilized spice - I love finding new recipes to try that feature it. Will have try this one out! I love coffee, but yet to try them spiced. I love cardamom my favorite spices. I am going to give it try. Looks delicious. I'm not usually a coffee fan but this sounds delicious! I love cinnamon and cardamom. This all together sounds amazing! Looking forward to giving it a try. This looks interesting. I've never heard of sweetheart coffee, I'll have to try it. I do like cinnamon. Ok, I totally need to try this. I am so used to my boring plain coffee... I need a change. Yum! I love the idea of a spicy creamy coffee. And I looove cinnamon and cardamom! Sounds warm and comforting. Love that you used cardamom. I've been wanting to use cardamom in my tea but was afraid to. Now you have me wanting to try for sure. That would be the perfect drink to prepare for the hubs on Valentine's Day because he is a huge fan of cinnamon. I'm not a fan of cinnamon in drinks but I love it in bread and pastries. I've never tasted cardamom before though. Spicy creamer sounds like a fun treat. My colleagues love creamer at the office. They might be interested.